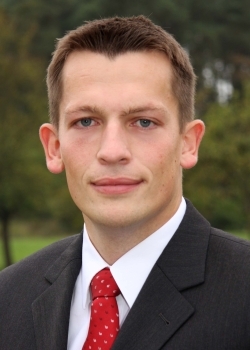 Karsten Thurn (* 29.05.1985, Heidelberg) schloss sein Studium zum Diplom-Ingenieur Elektrotechnik an der Universität Erlangen-Nürnberg im Mai 2011 ab. Seit Juni 2011 ist er als wissenschaftlicher Mitarbeiter am Lehrstuhl für Hochfrequenztechnik tätig und beschäftigt sich mit Themen der Radartechnik im Millimeterwellenbereich. J. Martinez Garcia, K. Thurn and M. Vossiek, "Characterization of Rotating Objects with Tomographic Reconstruction of Multi-Aspect Scattered Signals", IEEE Transactions on Aerospace and Electronic Systems, März, 2019. J. Moll et al., "Panel Design of a MIMO Imaging Radar at W-Band for Space Applications", in Proceedings of the 14th European Radar Conference EuRAD, 2017. J. Martinez Garcia, K. Thurn and M. Vossiek, "MIMO Radar for Supporting Automated Rendezvous Maneuvers with Non-Cooperative Satellites", in Proceedings of the IEEE Radar Conference, Seattle, US, 2017. K. Thurn and M. Vossiek, "Dual slope interlaced chirp sequence radar with improved target separation capability", in Proceedings of the IEEE MTT-S International Conference on Microwaves for Intelligent Mobility (ICMIM 2017), Nagoya, JP, 2017. F. Distler, G. Gold, K. Thurn, J. Schür and M. Vossiek, "Crosstalk Simulation of Multiple Insulated Twisted Pairs based on Transmission Line Theory", in Proceedings of the 21st IEEE Workshop on Signal and Power Integrity (SPI 2017), 2017.